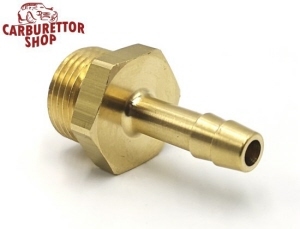 Brass straight 6 mm Pipe Union with 3/8th thread. Union with 3/8" NPT thread for fuel lines with an internal diameter of 6 mm. As an alternative, you can use our Loctite 542 Thread Sealant which will offer the added properties of protecting your connections from undoing themselves. Despite the barbed edge on these unions, we strongly advise you to secure your fuel lines using our Premium Quality Stainless Steel Jubilee Clips. For your convenience, you can order these right along with the joiner by simply selecting them through the dropbox.